Forsyth County, located in the Triad region, is the fourth-largest county in North Carolina, with a 2010 population of 350,670 residents. The county seat is Winston-Salem. Forsyth is named for Benjamin Forsyth, a war hero from Stokes County who was killed in the War of 1812. Originally settled by Moravians, the town of Salem developed within the land that the Moravians called Wachovia. Richard J. Reynolds located his tobacco company in Winston-Salem in 1875 and it dominated the area’s economy for over a century. However, tobacco no longer dominates in Forsyth County, which is changing demographically and economically. The county is less working-class than it used to be, and its share of ‘knowledge workers’ has increased. The medical industry is growing strongly here. Like most urban counties, Forsyth has attracted a number of out-of-state residents, influencing the county’s politics. 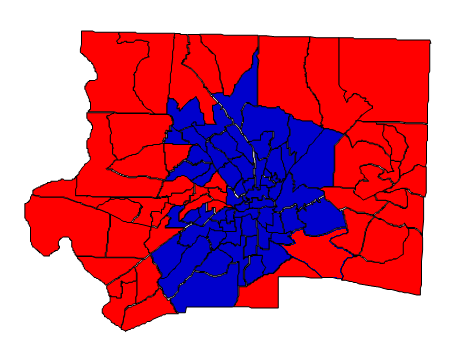 Forecast: Forsyth County was historically Republican. It was located in western North Carolina and had a large metro area, two factors making it more Republican than most areas in North Carolina. Winston-Salem was smaller, and the red rural areas packed a lot more power. But the politics of Forsyth County have changed substantially since 1996, when the county backed Jesse Helms in his bid for a fifth term and when opposition to President Clinton’s attacks on the tobacco industry caused an upsurge in Republican support. Since then, the county has trended consistently Democratic, though it did so in 2012 by only .14%. It can now be considered a center-left county. Winston-Salem has grown faster than the county’s outlying rural areas, making the county more Democratic and urban. Most of the inmigration has come from the Northeast or Florida. The county growth rate during the 2000s was 14.57%, stronger than the national average. Whites now constitute only 62% of the population; greater registration of blacks during the Obama election cycles has made winning elections here difficult. Still, Forsyth is still the strongest Republican urban county in the state, with the exception of New Hanover. Democrats should hope for growth in the county to rebound; thus far it has been very favorable to their prospects. And finally, they should continue to motivate black voters to turn out; failure to do so will make Forsyth County far more attainable for Republicans. But the underlying trend favors Democrats.